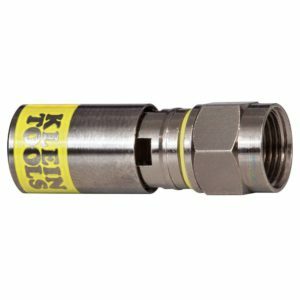 Klein does it again with another solid offering for their multi-connector compression crimper. It easily handles F-Type, BNC, and RCA connectors. I recently had to purchase a new crimping tool for a project where I would need to compress BNC and F-Type connectors. It had been quite some time since I last needed to do some cabling. That was evident by the old-school crimpers I owned, before compression connectors became popular. So, time to upgrade. I poked around the inter-webs to see what others were using and, and of course I wanted something flexible. 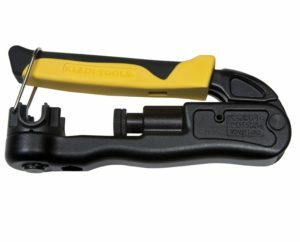 I came across the Klein Tools VDV211-063 Multi-Compression Crimper. I was really excited to get it in, and take it for a test run after reading what others had said about it. Upon arrival I tore open the package and began playing, err, testing the tool. I immediately noticed the impressive weight and build quality of the compression crimper. It felt nice and comfortable in my hand, looked nice, and as I would soon find out it performed powerfully too. I started out on some RG6 Quad shield cable since it was the fist thing I came across. I happened to already have one of the Klein F-Type Universal Compression Connectors (VDV812), which is supposed to work with any type of coax cable. I used a cable stripper with depth gauge to simplify the strip and deal with the multiple layers from the cable that require different lengths for the cut. The cable was stripped in a few seconds. Now using the crimper I rotated the saddle to match my F-Type connector and adjusted the stop plate easily. As it’s new out of the box, it will require some basic adjustments to match your connector of course. Next I slid the connector easily onto the RG6Q coax cable, placed the cable into the compression crimper, and with one smooth motion the connector was compressed and my termination complete. It almost felt like I was forgetting something. I double-checked my work and gave the connector a few good tugs to check for strength, and everything seemed in order. I was quite pleased with the first use of the tool. I continued on to do a few more cables for the sake of practice, but didn’t want to get too carried away with the expensive price of compression connectors. After I was finished with the RG6Q cable, I thought I would try a BNC connector next. I grabbed a couple Klein BNC Universal Compression Connectors (VDV813) for the task, and found some older RG6 cable buried under some boxes in the garage. It was at that point I realized my garage was well overdue for a thorough clean-out. Hmm, probably going to be winter project with as hot and muggy as this summer has been. Anyway, I stripped the RG6 and slid the BNC connector on like magic! Once again a simple squeeze of the solid and weighted handle and the tool practically did the work for me. I knew I was going to enjoy using this tool for my upcoming project. My final thoughts for this compression crimper are pretty straight forward. Number one, excellent tool construction with a solid weighted feel and nice cushion grip for easier use. Number two the tool looks fantastic with the black and yellow color scheme, while the size is small enough to drop it in a standard pant pocket. There is a swinging bracket that holds the spring-loaded handle in the downward position to keep the tool manageable while being stored. Number three the tools is adjustable in two main areas: the cradle and the connector-stop. This adds flexibility when using various kinds of connectors, but at the same time may require minor adjustments that could slow progress. If sticking to a standard connector this should not be an issue. Overall the Klein Tools Multi-Connector Compression Crimper (VDV211-063) is an excellent addition to my toolbox.